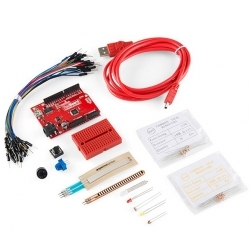 This version comes with our new SparkFun RedBoard Arduino clone and SparkFun USB Mini-B cable! Also included is a multitude of parts and sensors so you can start messing around with projects. RedBoard - Programmed with Arduino Uno bootloader - The SparkFun RedBoard, fully assembled and tested. Tri-Color LED - Use this LED to PWM mix any color you need.